Over the wall is a new feature here at Rubbings Racing. 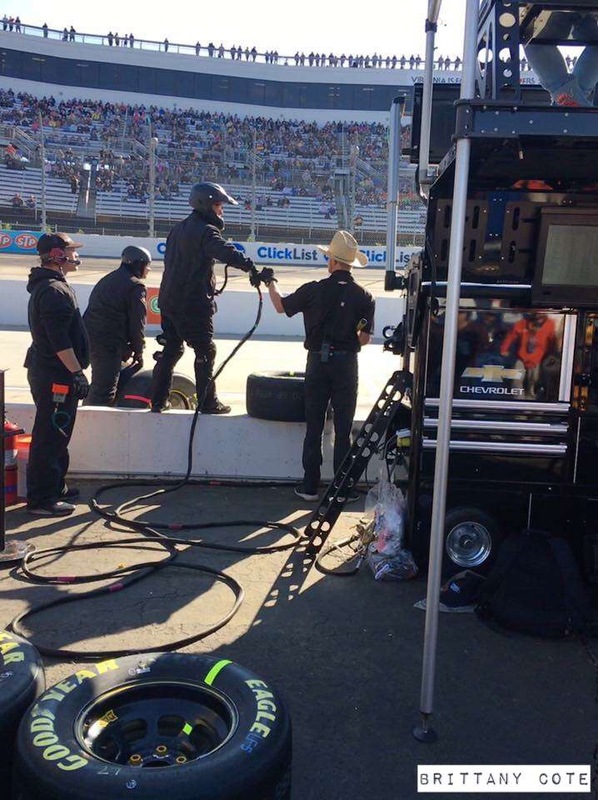 As often as possible we will feature a NASCAR pit crew guy or girl. 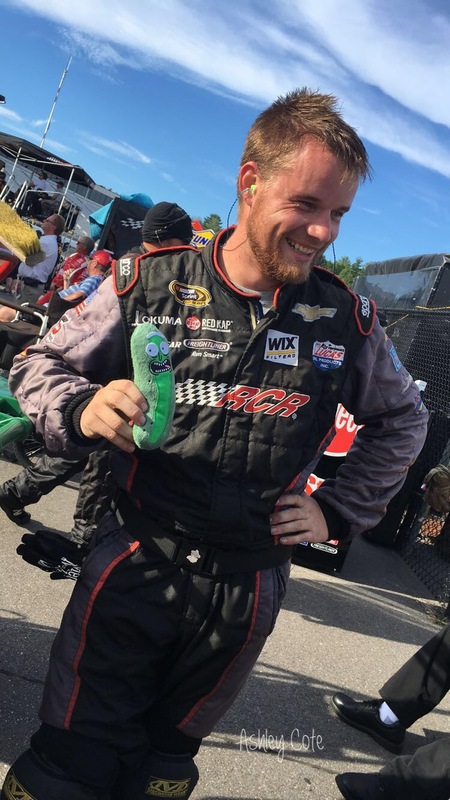 In this week’s first edition get to know George Balfanz Jr.
Sarah Handy: What are your earliest memories of NASCAR? George Balfanz Jr: My dad watched the races every Sunday afternoon and I remember plopping my behind on the couch to watch with him. The voice of Benny Parsons brings me back to being a kid. SH: Who was your favorite driver while growing up? GBJ: By far it was Mark Martin. I disliked Jeff Gordon because he always won the races and kept Martin from winning championships. SH: What’s the first race you attended in person? GBJ: The 2007 Coca-Cola 600 at (at the time) Lowe’s Motor Speedway. I was a sophomore in high school and that cemented my decision to make a push to work in NASCAR. SH: What was your first job in NASCAR? GBJ: My first job was at Richard Petty Motorsports as the guy that took out garbage, filled drink containers, organize, and help run parts. After a year of that they finally let me work on the cars final assembly. 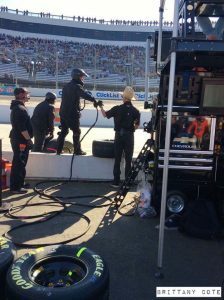 That also led me to the race track as pit support for the 9-car driven by Marcos Ambrose, which in turn got me time on the pit pad at Roush, ultimately opening my doors to changing tires. SH: Do you have a favorite memory of working in racing so far? GBJ: A lot of people talk about winning being their favorite memories, but mine was a second-place finish at Iowa, with Ryan Sieg. Our pit crew was a bunch ofÂ “nobodies” because we didn’t work for a big team. All day, we outperformed the big budget guys and made passes on pit road and made the right adjustments to the car. 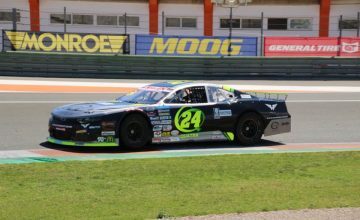 We finished 2nd behind William Byron. Just needed a couple more laps to pass him! SH: What current track on the Monster Energy NASCAR Cup Series circuit do you believe provides the best racing? GBJ: In my opinion, I think Bristol offers the best racing. You can have a fast car and not know how to drive it but know how to drive and make an average car work for you. Its tight, people beat and bang and tempers flare. Things happen quick so you’re always on your toes. Not many dull Bristol races that I can remember. SH: Do you often have to raise your voice to fans in the garage area to move out of the way of car and crew? GBJ: Yes. All the time. Have to keep your head on a swivel in there. Fans ogle at their favorite car or driver but forget that cars are moving around. Race day is usually the worst because so many more people are there. Once, while running fuel, I was hustling to get the fuel cans refilled and a guest was not paying attention and he turned around only to be greeted by a fuel head to the face. Fuel head 1, Guest 0. SH: What’s the craziest thing you’ve ever seen in person during a race? 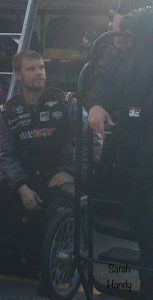 GBJ: I’d say watching Austin Dillon flop across the front stretch at Daytona, then watching the crew members run out to the car to see if he was okay. It was surreal because we all know what can and what has happened in the racing biz. SH: Do you have any race day routines? GBJ: Days at the track are pretty routine in and of themselves. Schedules vary slightly but it’s almost always the same processes. As pit crew, I get there when gates open, grab a bite to eat, set up pit box, clean and glue wheels and try to keep myself as relaxed as possible. 1 hour before green I change into my fire suit and head out to pit road. I inspect lug nuts and make sure my work area is organized and tidy. Any and all of my supplies that I would use during the race are within a quick reach, so I don’t need to go far. I guess you could say the whole day is something of a routine. Just no strange things. SH: If you had the opportunity to add any track to the schedule, which track would you choose, and why? GBJ: I would really like to see a cup race at Iowa Speedway. It’s such a small track and is really fast. 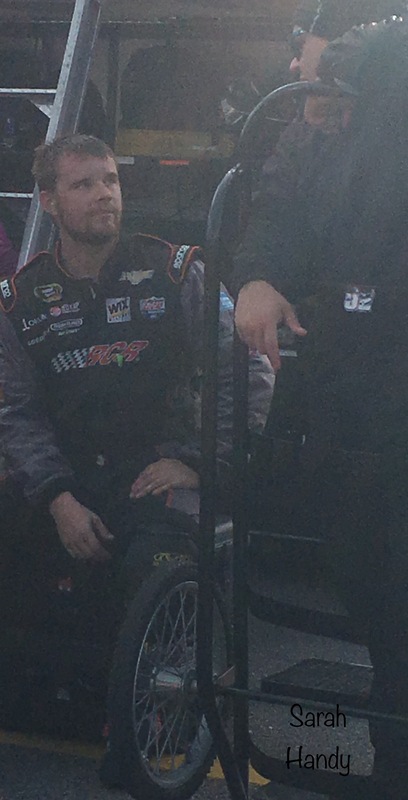 SH: Some say NASCAR’s season is too long, do you agree, or do you feel it’s just right? GBJ: I’d say it’s just right. It would be nice to have an extra weekend off mid-season but having two months off during the holiday season is a pretty good chunk, considering I’m chomping at the bit in January, to get back on the road. GBJ: You know, I don’t really know why the hat became a thing. I wore it one day and someone gave me crap for wearing it so I kept wearing it. It makes for good conversation because it’s unique. Eventually people recognized me as the guy with the hat. I suppose there are worse things to be known for! SH: What’s the best advice you’d give someone who wants to work in racing? GBJ: Be ready to work your tail off for very little at the start. We call it ‘paying your dues’ long days and late nights. You need to get experience and you’re not usually going to start in a big outfit without knowing someone. That’s the next thing. Meet people and talk to them. Networking will pay dividends down the road if and when you find yourself in a tight spot. SH: Do any food places stand out that you like to visit when traveling for races? What’s your favorite food in general? GBJ: I love just about any KC Barbecue. Arthur Bryant’s is probably my favorite thus far. Anything easy coast means seafood. Miami means Cuban cuisine. I try to go to new places every time I travel, avoiding large chain restaurants. Cities have a name and they have a taste to go along with it in my opinion. SH: For some that may not know, what do you enjoy as hobbies when you aren’t traveling for races? GBJ: I am a Twitch streamer for the most part on the side as well as an avid cyclist. Though I haven’t ridden the 10,000 miles this year or the last few years or raced a bike recently, I can still hop on the ol’ steed and give people a run for their money. SH: What’s your favorite genre of music, band or artist? GBJ: I’ve always been a fan of everything. My favorite band is Thirty Seconds to Mars but goo goo dolls, Garth Brooks, Three Days Grace, Paramore, Shinedown, Eminem, MJ, *NSYNC, Justin Moore……the list goes on and on. Below are the questions that were submitted by some fans on social media. Ashley Cote: Who’s your favorite twin? GBJ: Anyone who knows me from social media or better knows the one that wears the boots all the time. 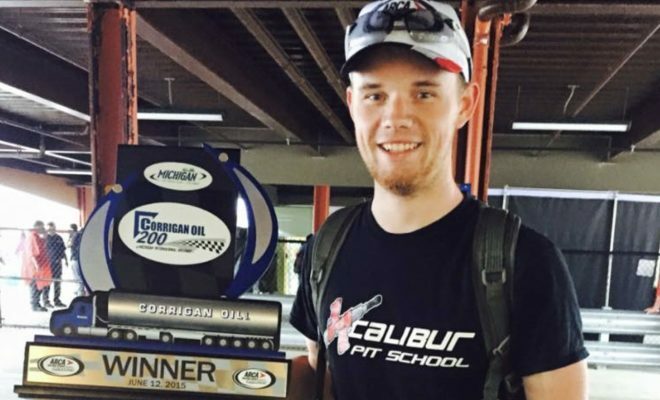 Toby Christie: What’s the craziest injury you’ve experienced as a pit crew member? GBJ: I would say it’s not so much an injury, but a product of the environment… in the 2017 Coca Cola 600 I had a lug but come off and hit my tooth, chipping it in a way that isn’t able to be fixed, but later in the race I had another lug come off and zip across my face leaving a mark for a couple weeks. PSA: Wear your safety gear kids! Lisa Lineberger: What made you want to be a pit crew member and was that something you always wanted to do? If not, what do you think you’d be doing? GBJ: From the time I could control any kind of car…RC, Electric etc… I wanted to drive a car. Wanted to be like Newman and get an engineering degree and drive a race car. Well that wasn’t an option financially, so I figured the next best thing was being a real-life frogger player. Being a wrestler for a number of years helped build the fundamental athletic ability for it as well. If I wasn’t working in racing, I may be in the military, a Machinist or a culinary artist. 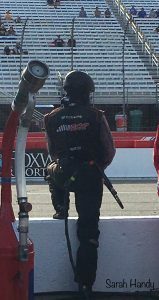 Adam DeBlasio: What is something that you did not know or expect before becoming a NASCAR crew member, and/or something the average fan doesn’t know about being a NASCAR pit crew member? GBJ: I didn’t know how hard it was to get your foot in the door to begin with. Being a non-native to North Carolina, it was hard to guess the lifestyle necessary for this sport. I didn’t know that I’d be working 12-15 or more hours 7 days a week before Iâ€™d make a decent living. The average fan may not know that most pit crew guys have jobs outside of racing whether they work in the race shop or not, outside of their weekend obligations and work outs/Practice. I’d like to thank George for taking the time to answer the questions for this piece. 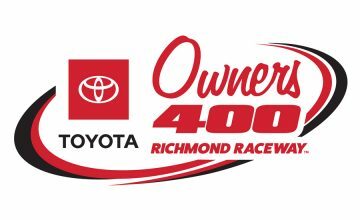 Be sure to keep a look out for him this season at the race track (or just look for the hat) as he will be working all four series!